Azimut Atlantis 43 will be making its world premier at the Düsseldorf Boatshow in Germany, which will take place from 17th to 25th January, 2015. The latest yacht in the Atlantis Collection from Azimut, it is both spirited and refined and allows the freedom to select prestigious Italian designer fabrics, by Missoni, Armani, and Loro Piana. 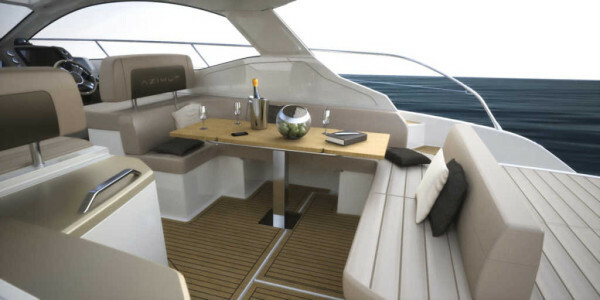 The Azimut Atlantis 43 is an open version, with smart and functional solutions. The deck is transformable and functional, featuring two large three-person sunpads, one to the stern and one to the bow. The large hard top offers protection from the sun and wind. The Azimut Atlantis 43 has a one piece windshield and lateral picture windows, which allow for ample natural light. The exterior living area is furnished with a dining room table, a sofa, and a kitchen area. The relaxation area next to the pilot station provides a comfortable vantage point from which one can enjoy every moment of the cruise. The stern area has a 3.5 sq.m. space of decking, which can be used to haul in and launch the tender or water toys that can be stored in the garage. 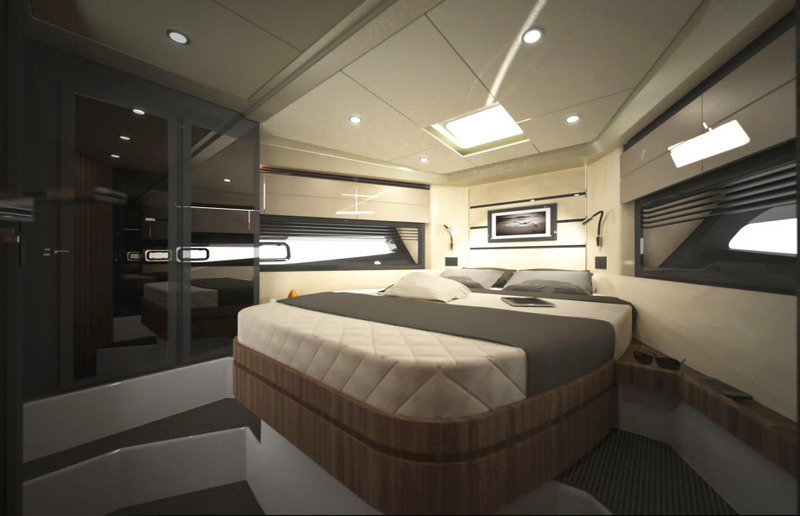 Below deck to the bow is a full-height Master suite, which includes a bathroom with a separate shower stall. Two closets, two sets of wall cabinets and a large compartment that is accessed by tilting the bed provide ample storage space. The guest cabin has sliding beds that allow one to choose between a queen and two twin beds. Another option is provided with a third bed along the left-hand wall. 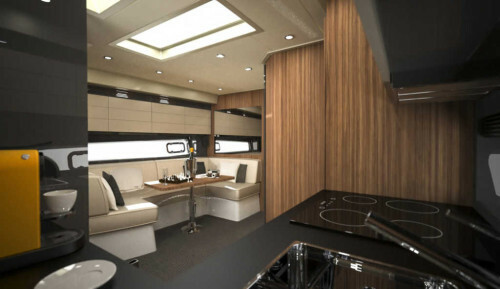 The living area is located amidships, and includes a comfortable and welcoming kitchen zone and a dinette with a height-adjustable table that can also be converted into a bed! The second onboard bathroom is accessible from here, which also includes a separate shower stall. This is meant to either serve the guest cabin or function as a daytime bathroom. The Azimut Atlantis 43 is powered by two V400 HP Z-drive Volvo Penta D6 engines that allow for a maximum speed of approximately 33 knots. Azimut Yachts offers the most extensive range of 34′-120′ yachts. It operates in 68 countries with 138 sales and service centres and has representative and support offices in Shanghai, Hong Kong, Fort Lauderdale (USA), and Itajai (Brazil). You can get in touch with them via email. Tagged Big Boys' Toys, LifeSpice, Luxury Travel, yachts. Bookmark the permalink.